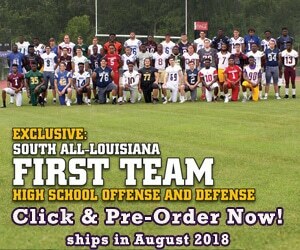 Bossier HS Football has a small number of kids for a 4A school. Still, they work hard and fight every game. OL Mario Flores is a Junior Center for the Bearkats. He has started the last two seasons and will be a big part of that O-Line in 2016. Keimun Daniels is an underrated athlete (Junior)who does everything for this team including playing QB. These guys do a great job leading their team every week. Check them out in today's Recruit Video! Two guys who stand out for the Thomas Jefferson Jaguars are LB David Lewis and DB Marlon Wilkins. Lewis is a leader on the Jaguar defense. He is a smart player who moves well and knows how to make a hit. DB Marlon Wilkins is one of the most athletic guys on the team. He is a ball hawk with the ability to play Safety or Corner at the next level. Check these guys out in today's Recruit Video! Cecilia QB Landon Roberts is having quite a year with over 1300 yards passing and 23 total touchdowns. He is a big reason why his team is 8-1 and looking to make a strong run in the playoffs. Meet Landon in today's Recruit Interview. LAFM 10th Season! Episode 9! November 3, 2015	Comments Off on LAFM 10th Season! Episode 9! We have a great show lined up for you this week. Head Coach David Brewerton and Head Coach Guy Mistretta stop by to talk about their respective teams success (Zachary and Livonia). Carroll High School's Head Coach Jackie Hamilton calls in to talk about his teams outstanding season. Also from North LA, Head Coach Byron Dawson calls in to talk his team, Evangel Christian, who may be the best team in the entire state. Should be a great show, make sure to tune in to LAFM TV! Keandre and Jarnell Harris exemplify what it means to be a Haynesville High School Football Player. Keandre is an outstanding player who will play DE, LB, FB, and even Kick a Field Goal every now and then. Jarnell is an outstanding Athlete who plays Safety and WR. Both of these kids could very easily be playing at the next level in 2016. Meet them in today's Recruit Video! We have a great show lined up for you this week. Lee goes over the 5A-1A High School Players of the Week. Ronnie Alexander, Calvary Baptist DC, stops by with two of his outstanding recruits: DB Hunter Hand and DE/TE David Fitzwater. Former ULM TE and Fieldhouse Bar and Grill owner Joey Trappey calls-in from Monroe. Alexandria Senior High QB Matthew Beck also calls in to talk about his team's outstanding year. Lastly, Lee and Reid go over their college and high school picks. Should be a great show, make sure to tune in to LAFM TV!